The U11 Girls White team was able to bring home some silver after a great weekend performance. The girls reached the final game after 3 outstanding group stage games, where they recorded 2 wins and a tie with a total of 15 goals for and only allowing 1 goal. The girls player very hard but were defeated by United FA 01 England on the deciding tournament match. Congratulations to the girls on a great presentation and hard work displayed. The U12 White team began its fall 2011 season by reaching the finals of AFC’s Sizzlin’ Summer Soccer tournament in Fayetteville. The girls dominated their opponents by shutting out two of the three teams they played and outscoring them 10-1 to reach the finals. In the final match they were defeated by United FA 00 White. They are trained and coached by Myke Epps. Congratulations to the U10 Macon United Red team for being crowned champions of the AFC Summer Sizzlin Preseason tournament! The girls played very well in their first games of the season, winning all four matches and outscoring their opponents 19 to 6 goals. Their level of play improved as the tournament progressed and they brought home a strong championship win with a 3-0 score. Pictured left to right: Anna Lako, Taylor Buffington, Susan Hightower, Sara Kate Durkee, Trainer Brandon Davis, Gracie Mathews, Josie Lamb, Sydney Iulliucci and Wylie Byrne. On their first pre-season tournament participation, the U11 girls were crowned champions of the Gold Division. The team arrived to the final match after playing a very tough group stage where they recorded to 1-1 ties and a 3-1 win. In the final game, they played very hard and defeated CGSA Strikers by a tight score of 1-0 to lift up their first Fall 11 trophies. Congratulations to the U10 girls Macon United White team for being crowned champions of their division in the 1st annual Top Hat Puma Cup all girls tournament. The girls played very well in their four matches, coming away with one tie and 3 victories. They brought their best performance in their final championship match over Inter Atlanta with a 6-2 win. The girls did a fantastic job in outscoring their opponents 25 to 7 goals in match play. Pictured left to right: (bottom row) Kate Wimberly, Caroline Sutherland, Shelby Berryhill. (back row) Emma Crowe, Elizabeth Rodenroth, Molly Garud, Madelyn Davis, Madesen Mitchum. Coach Michael Garud, Trainer Brandon Davis, Coach Andrew Sutherland. Congratulations Ladies! 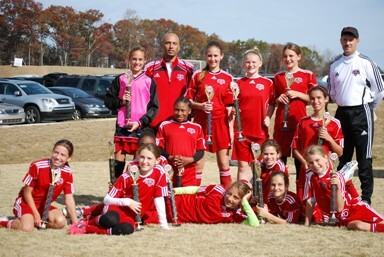 The U12 Red team began its fall 2011 season by being crowned Puma division champions at the Tophat Puma Cup in Atlanta. In the semi final match the girls defeated a tough GSA 00 Phoenix White team 4-3. Then, in the championship game the girls played outstanding defense to defeat a talented United FA 00 Black team 1-0. They are trained and coached by Myke Epps. During Labor Day Weekend, the U15 Girls participated in the Atlanta Cup Tournament, one of the largest 3 day tournaments in the world. The team was placed on the A Division where they had to face some very tough competition. With a great display and hard work, they won all 3 group stage games by a margin of 8-1, and qualified to the semifinal match. With great attitude and motivation to win it all, the girls won 4-0 and advanced to the Monday Championship Game. The team left everything on the pitch but unfortunately they were defeated by Fury United, from Shreveport, LA. Congratulations ladies and great job bringing the silver home! On their first tournament participation ever, our U9 Girls team lifted the championship trophies at the Cherokee Impact Academy Cup. The girls participated on the tournament’s White Division and reached the final match after winning their 3 group stage games outscoring their opponents by a combined score of 17-4. On the final game, the girls faced United FA’s U9G Congo team, and they took care of business with a final 5-1 result. These girls are trained by Keith Groeper and coached by Allen Luton. Congrats ladies! 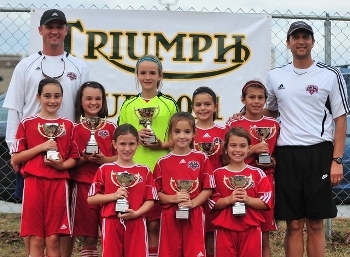 Macon United’s U10 Girls White team won the Triumph Cup’s White Division after recording 4 straight wins. The team qualified to the final game by winning their bracket with 3 wins (7-0, 3-2 and 4-2). In the final match they faced RYSA Revolution and after a very tough played match, the girls came out winning 4-2 and brought the trophies home. Picture: FR: Kate W., Emma C., Shelby B. MR: Sidney I., Madisen M., Maggie D., Elizabeth R., Molly G. BR: Brandon D. and Michael G.
For the fourth consecutive tournament this fall the Macon United U12 girls advanced to a championship game. Placed in the top U12 division at the Triumph Cup, the girls shut out their first three opponents by a combined score of 11-0 on their way to the championship game. In the championship game the girls battled a skilled ASG Florida 99/00 team from Tallahassee and gave it their all. The two teams were evenly matched, but a second half goal by the ASF Florida team put them ahead and the hard fought game ended 2-1. Congratulations on being finalists at the Triumph Cup! 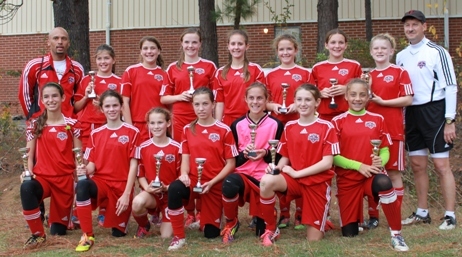 The Macon United U12 girls won the White division at Cherokee Impact Academy Cup. The girls defeated two tough teams from Tennessee on their way to the championship game. In the championship game they faced a talented Freedom 99 Navy team. The girls set the tone during the championship game with strong defensive plays that shut their opponents out for almost the entire game and several scoring plays to win 3-1. 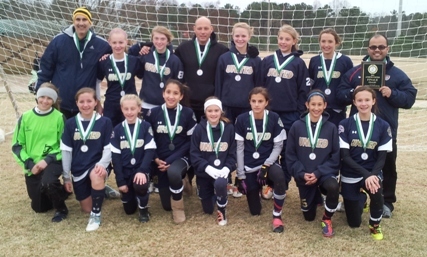 Congratulations to the Macon U12 girls! The Macon/Warner Robins United U14G reached the finals at the Athens United Finale Gold Division after playing 3 intense group stage games. On their way to the finals, the girls won 2 games (3-0 & 4-0) and tied one (0-0) against the same team they will meet in the final match, InterAtlanta FC 98 Blue. The final game ended also in a tie between these 2 teams (2-2), so the winner was decided with penalty kicks. Unfortunately, our girls were defeated but they surely did a great job and ended their season on a very high note. Congrats girls!